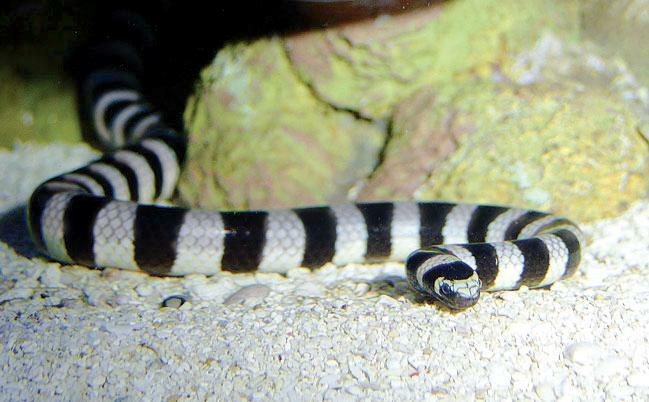 The Black-banded Sea Krait is a highly venomous reptile and is also known as the Chinese Sea Krait . 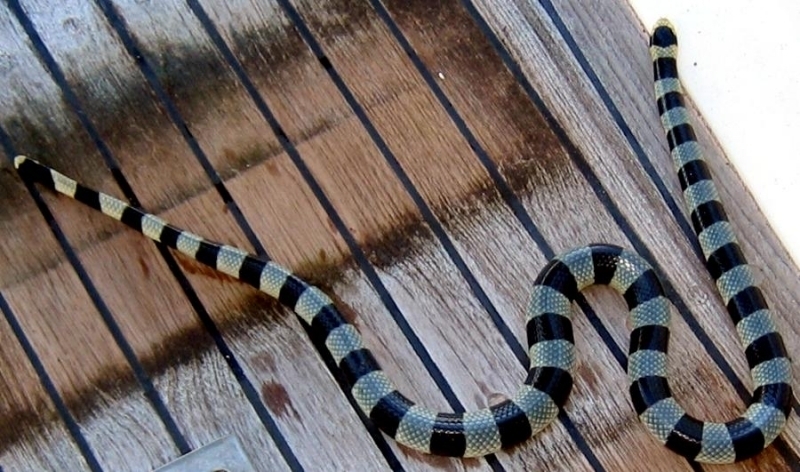 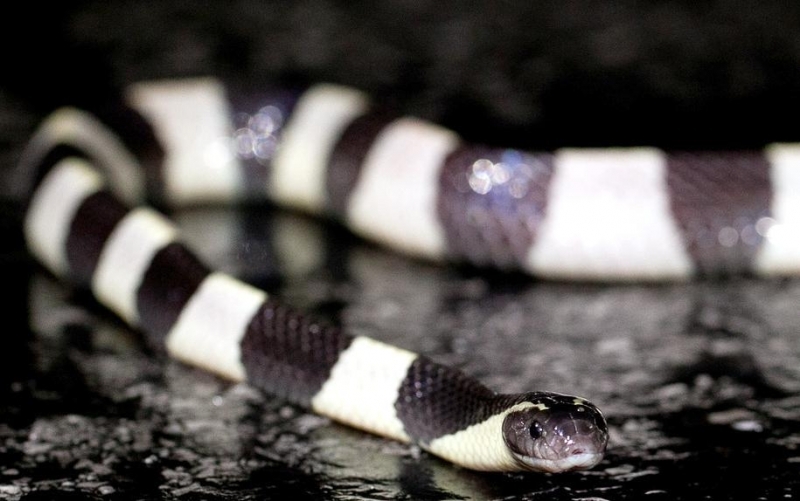 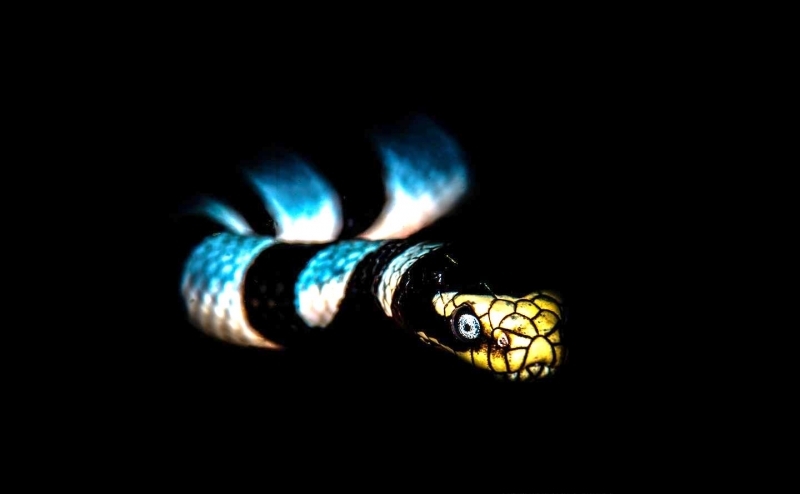 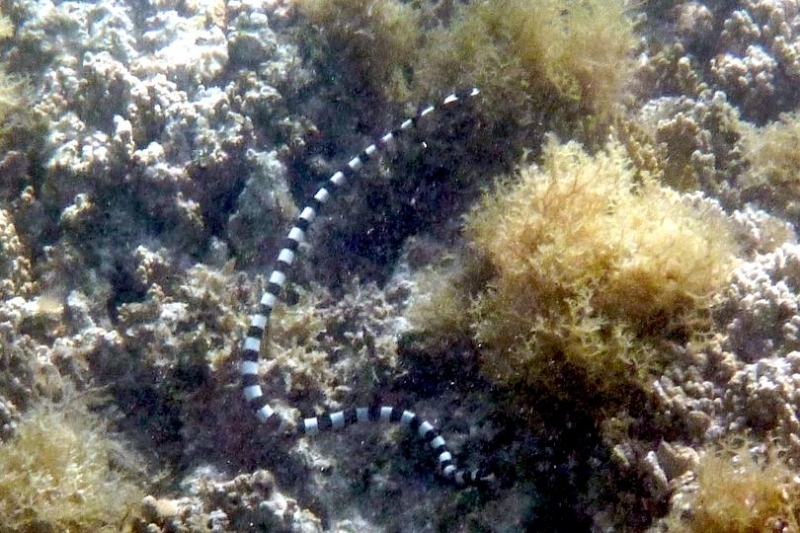 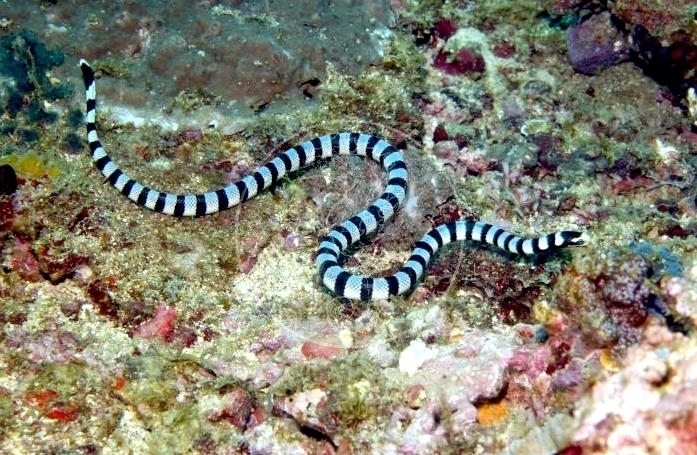 As a sea snake, Black-banded Sea Kraits are a unique reptile. 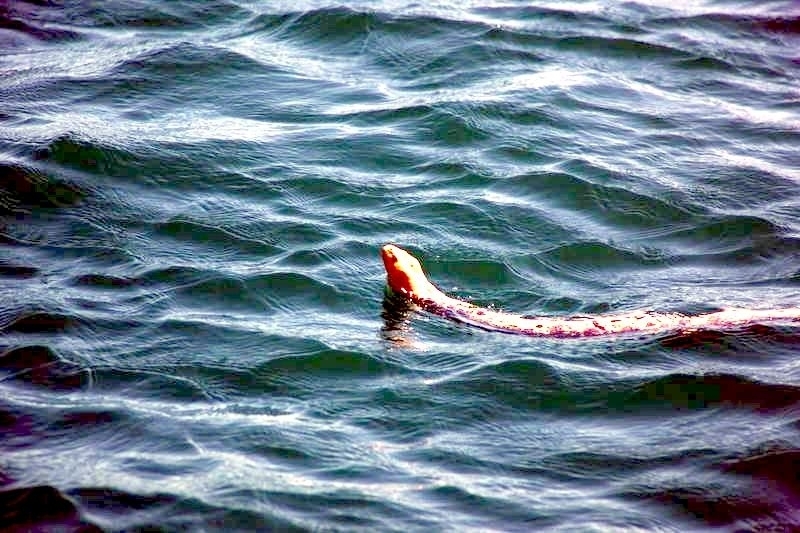 They are amphibious therefore, they are able to live on land or in the ocean. 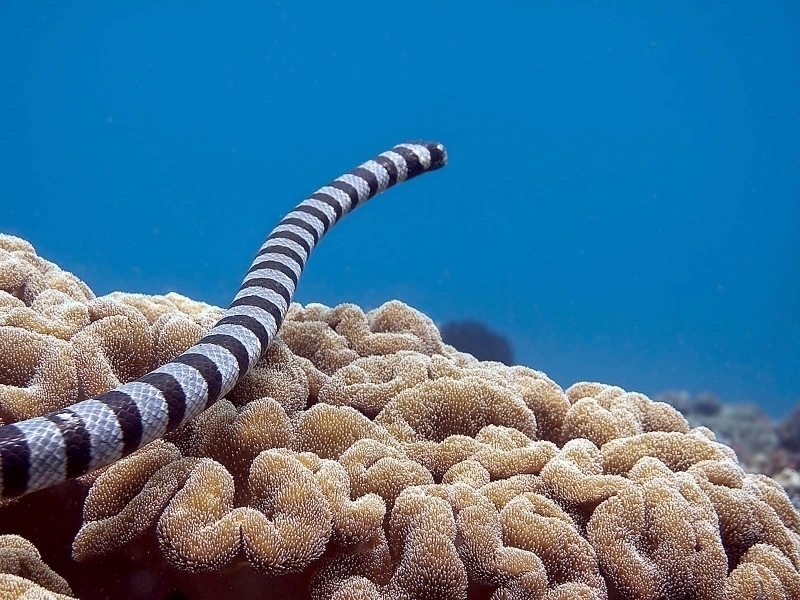 Their compressed tail helps them to move fast in the water however, they are most commonly found in shallow tropical marine environments, coral reefs & mangrove swamps. 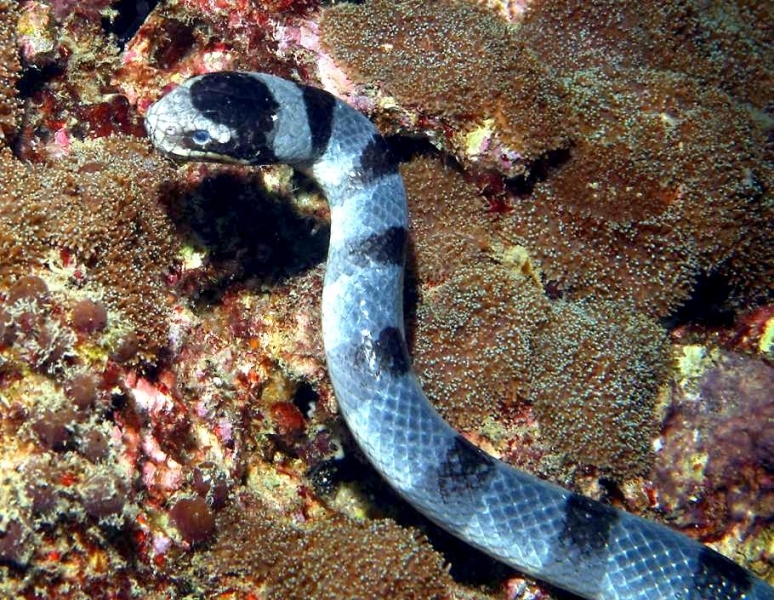 Unlike sea snakes, sea kraits routinely leave the aquatic environment going onto land to mate, lay eggs, digest food and rest. 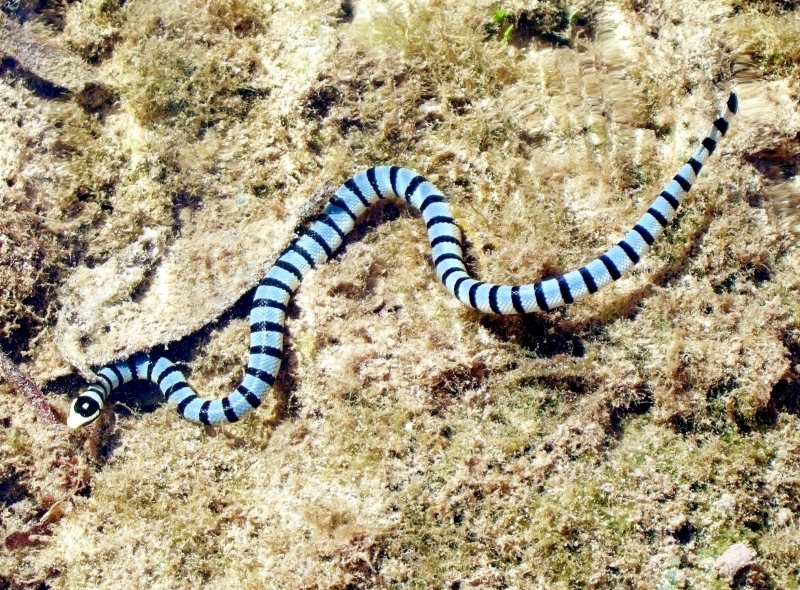 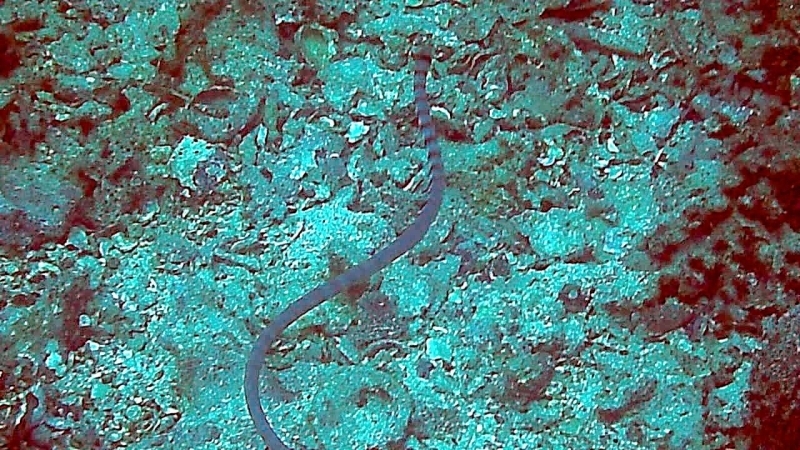 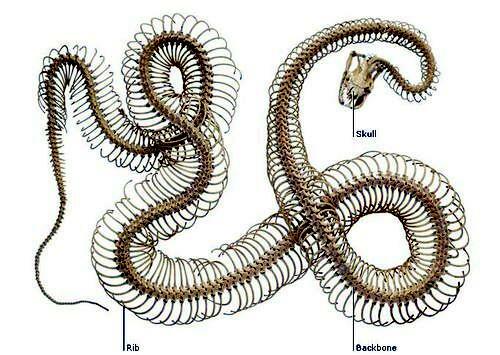 The bodies of all sea kraits exhibit distinct bands. 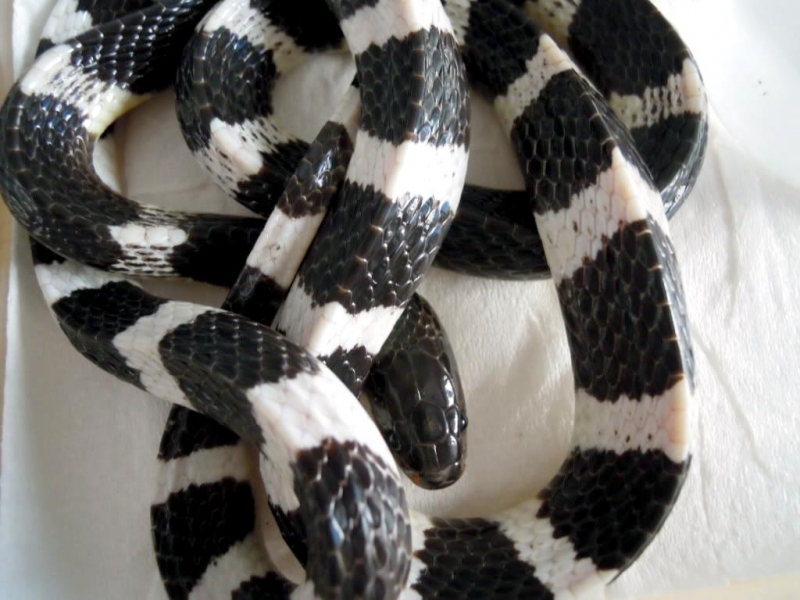 The common name “krait” is from Hindi (करैत karait), which is perhaps ultimately derived from the Sanskrit word (काल kāla), which means “black”. 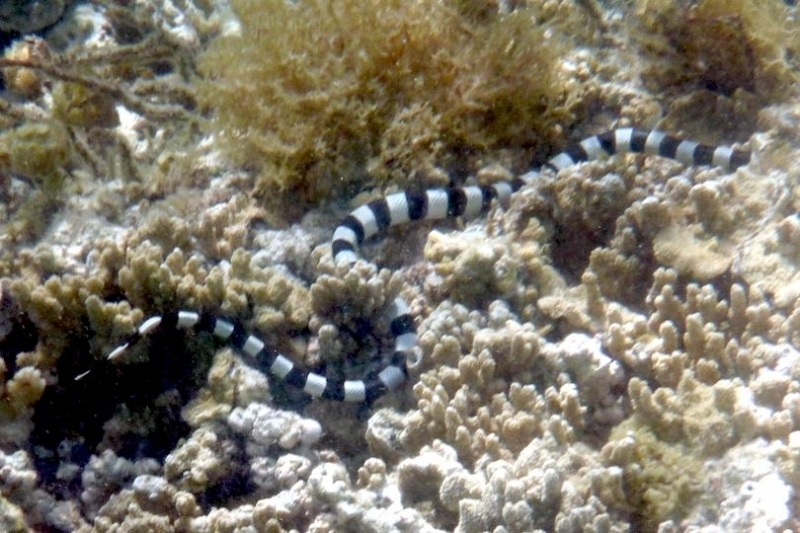 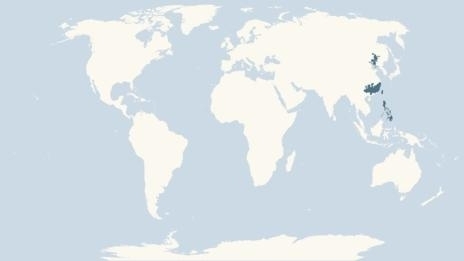 Black-banded Sea Kraits are found in the Pacific Ocean coastal waters of Australia, southeast Asia and Indian Ocean coastal waters. 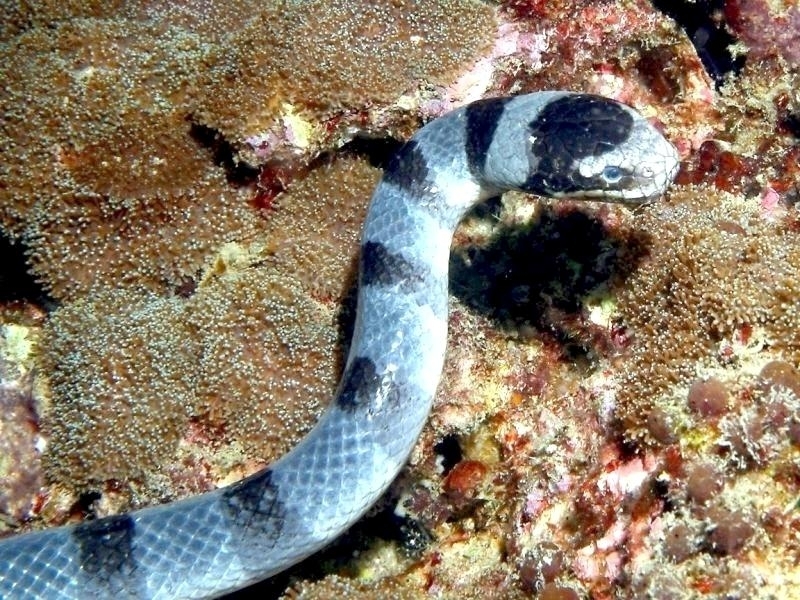 Black-banded Sea Kraits have blue or blue-grey color with approximately 20-65 black bands. 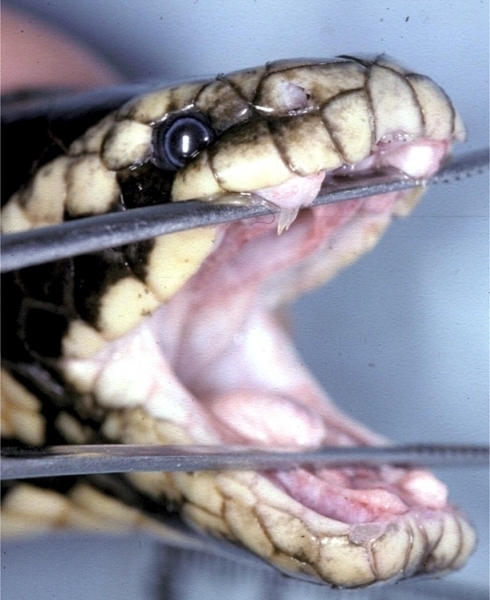 The underneath flesh of the snake is yellow or cream color with the snout & upper lips are usually yellow in color. 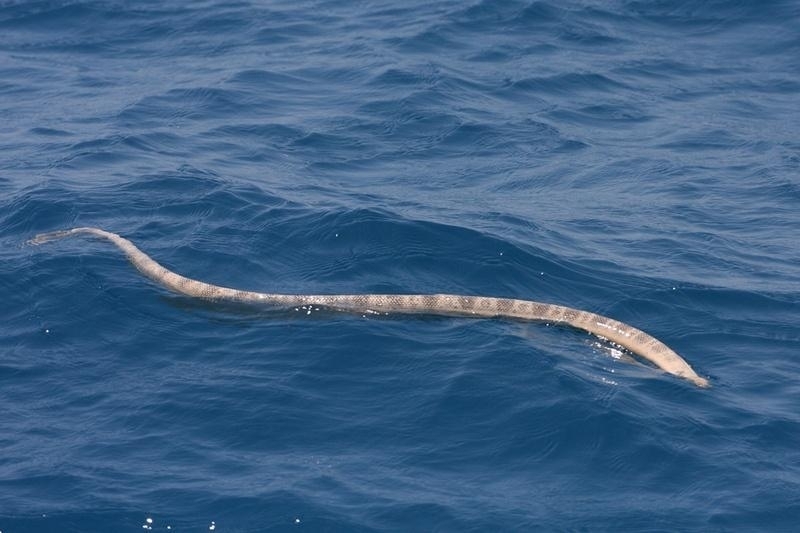 Their compressed tail helps it to move speedily in the water. 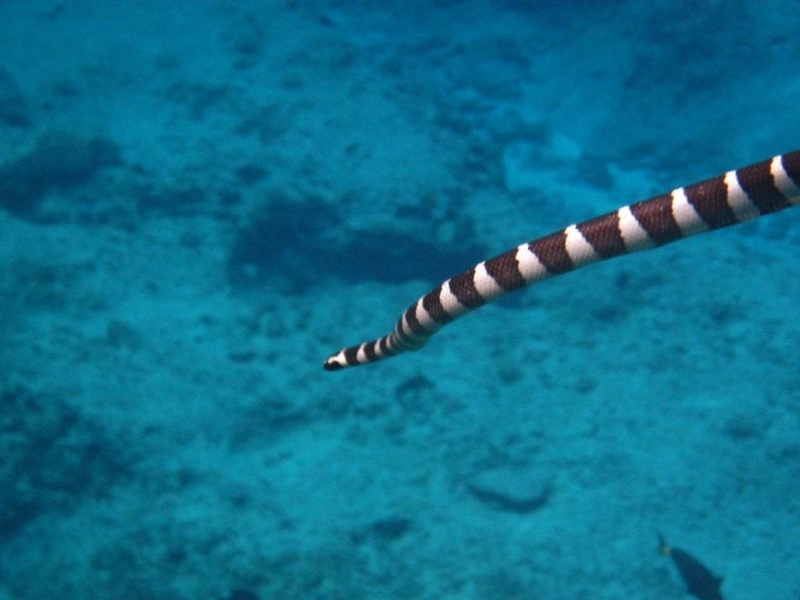 They had a blunt head. 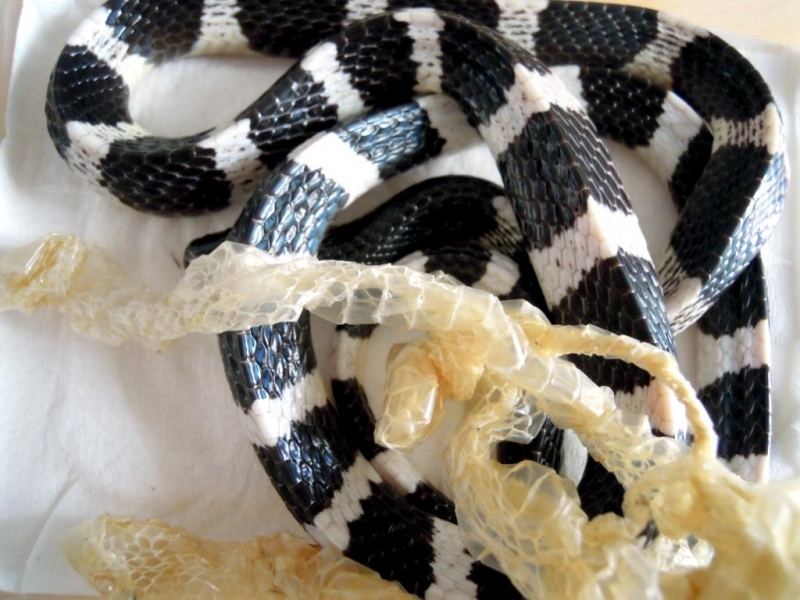 Their bodies are covered with scales and they have a flattened tail. 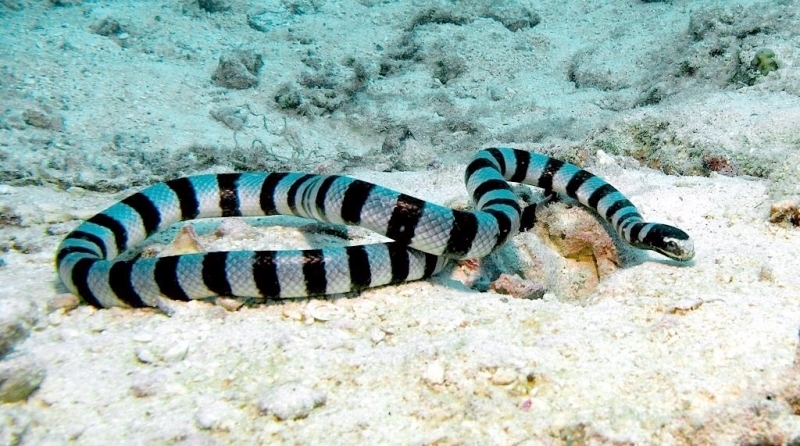 While the venom of Black-banded Sea Krait ranks among the most toxic in the world, they are so docile and non-aggressive that humans are rarely bitten, even in situations where the animal feels threatened. 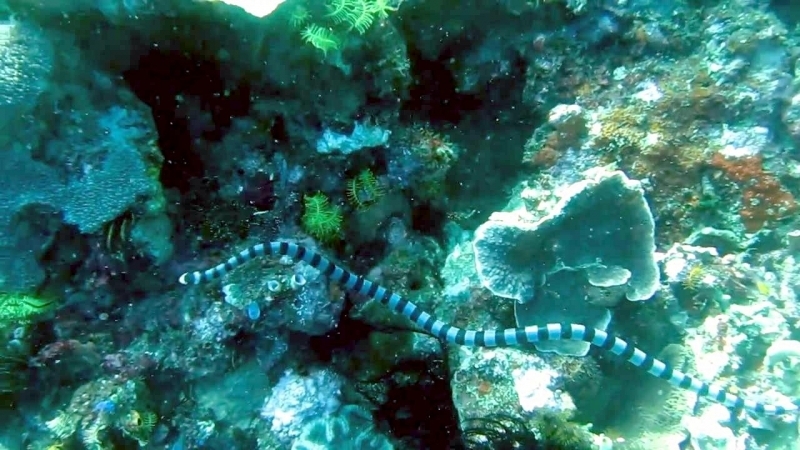 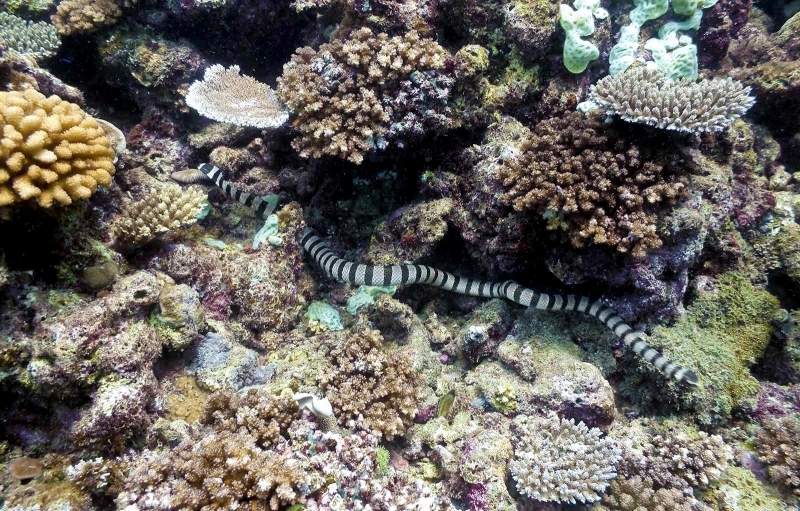 Black-banded Sea Kraits like to hunt their prey in crevices of the barrier reef because they are slow swimmers. 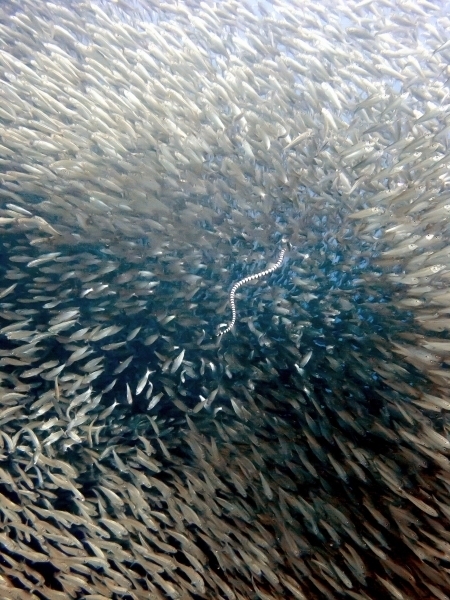 Due to their slow speed, they are unable to chase the fish. 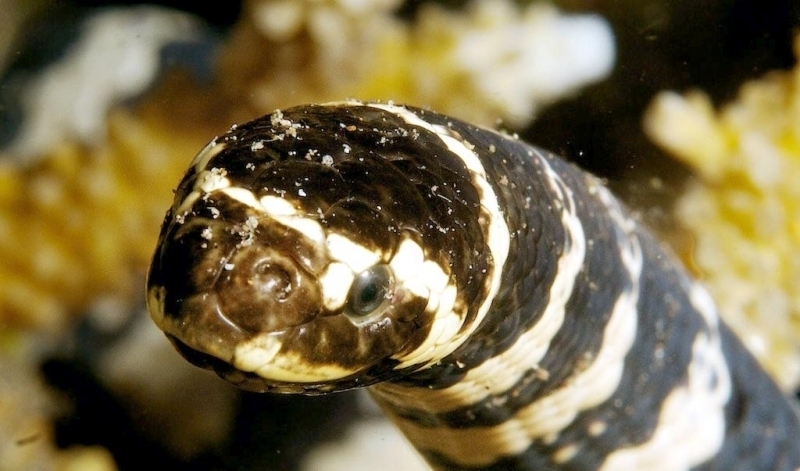 All sea snakes are ovoviviparous (development of eggs that remain within the mothers body up until they hatch or are about to hatch.). 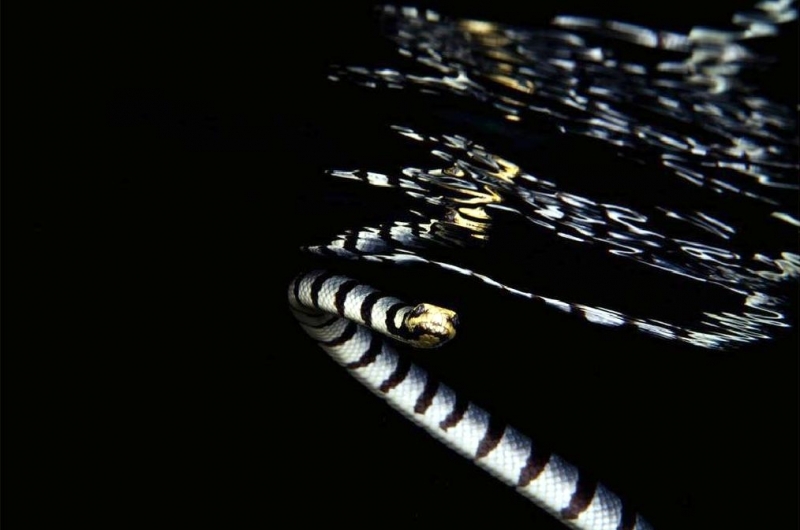 The young are born alive in the water where they live out their entire life cycle. 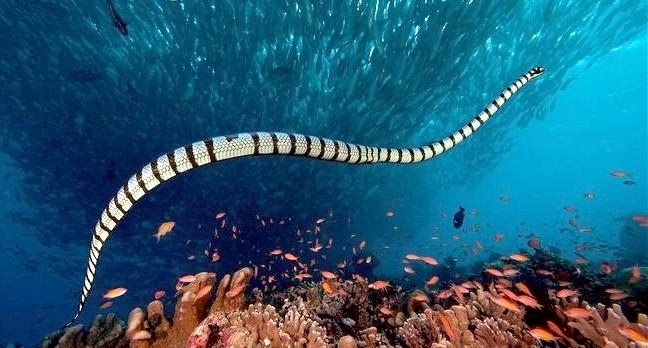 In some species, the young are quite large sometimes up to half as long as their mother. 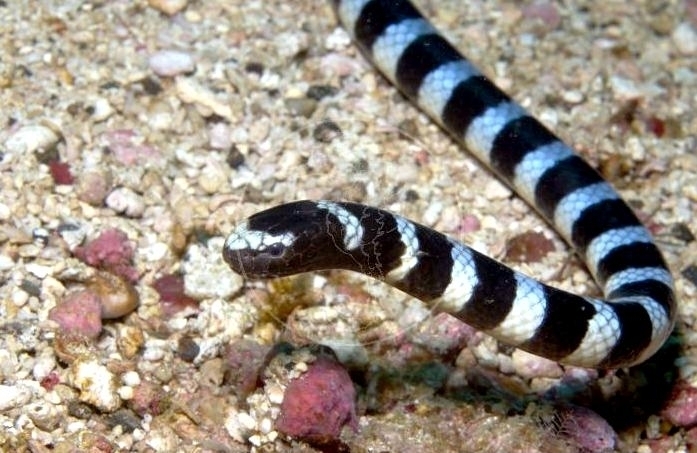 Baby Sea Kraits rely on the sand smelts & sand perches as food in order to survive. 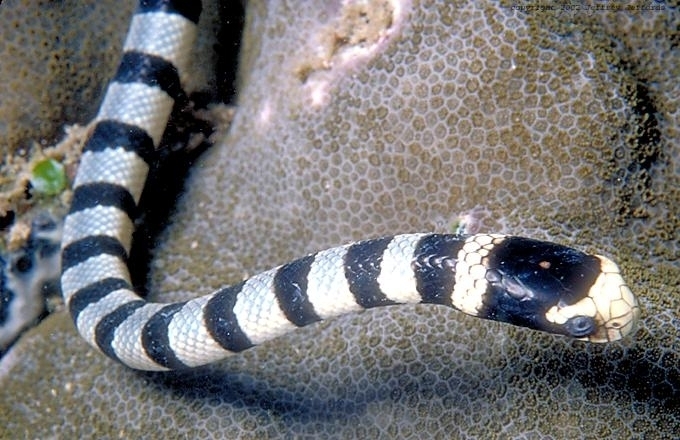 As a baby Sea Krait grows older, it will switch its taste to prey such as the Surgeonfish & Damselfish. 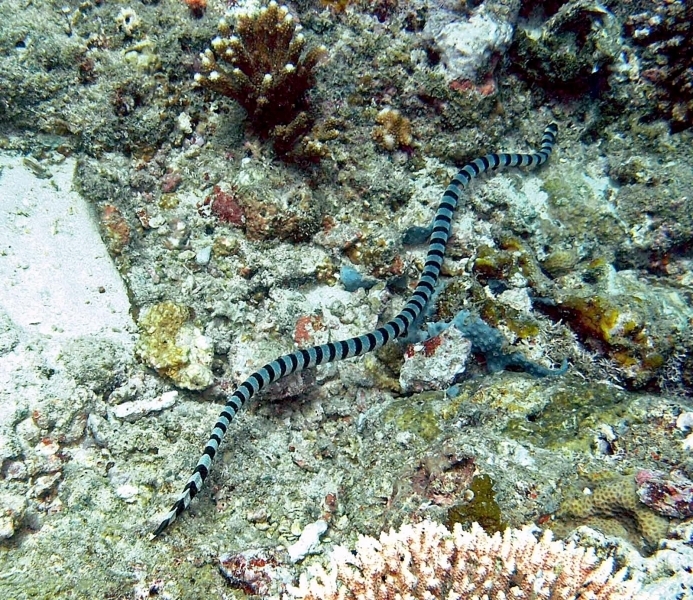 Since young Sea Kraits that are newly hatched cannot swim speedily, they must always ambush themselves among the coral so that they will not be hunted by larger predators. 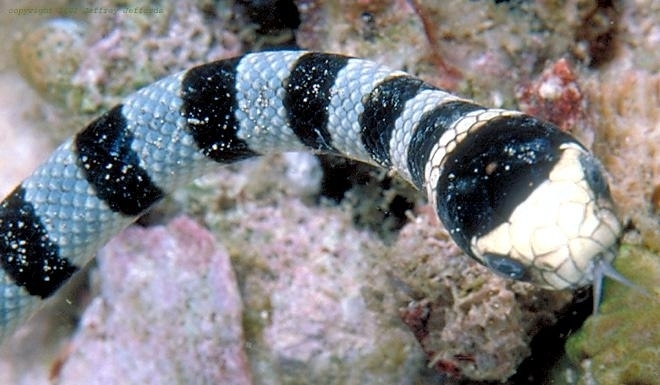 Like other sea snakes, the Black-banded Sea Krait may also face predation from animals such as sharks and seabirds. 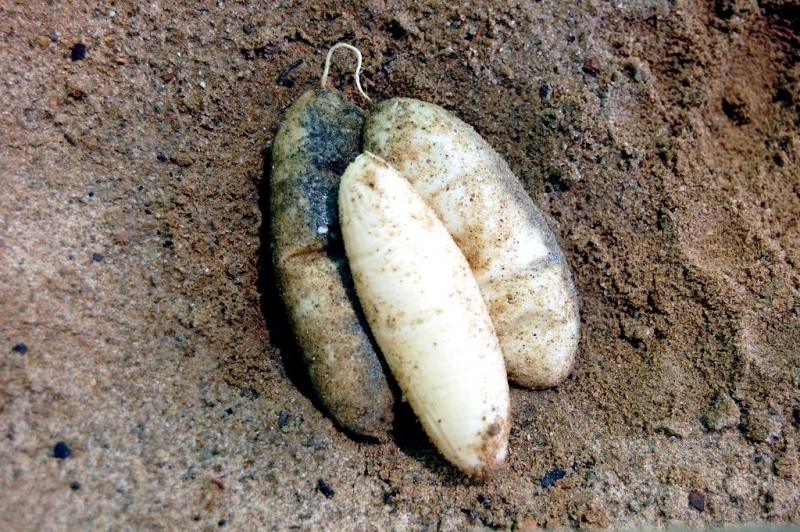 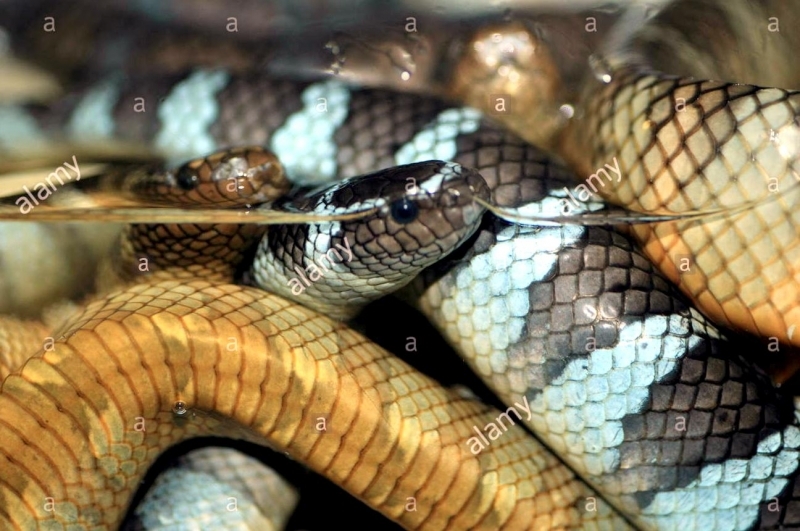 In addition, the snakes can become infested by ticks & small marine organisms that try to grow on them, which the snakes can counter by shedding their skin. 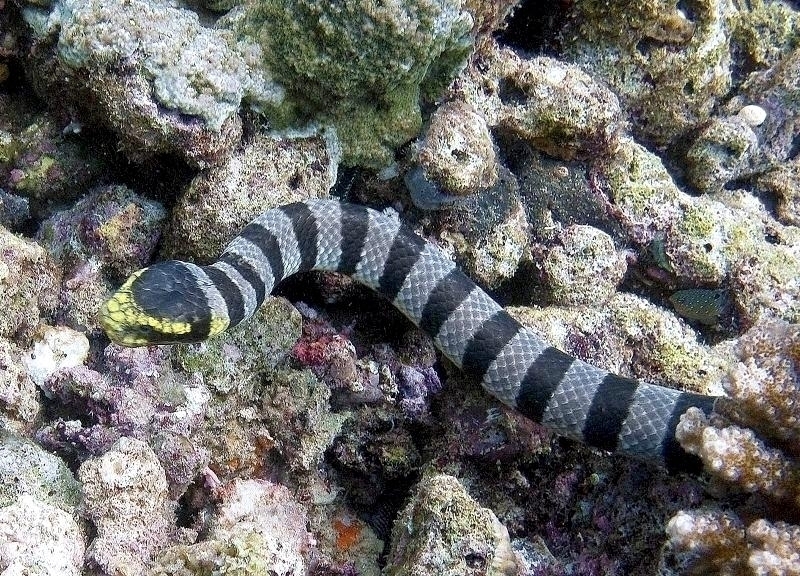 One interesting Black-banded Sea Krait fact is that it does not have gills like fish, so that they cannot stay underwater for a long period of time. 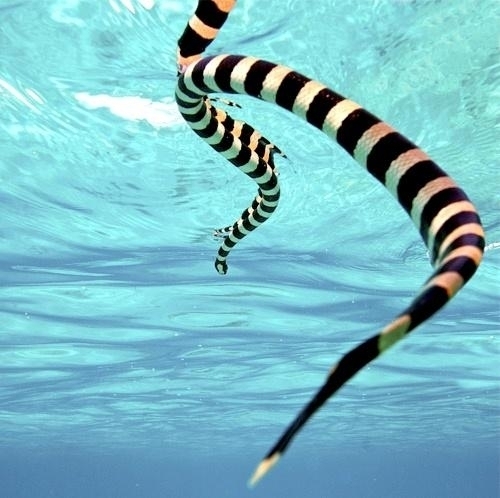 To maintain the appropriate oxygen level, they must resurface to the water from time to time to breathe in air. 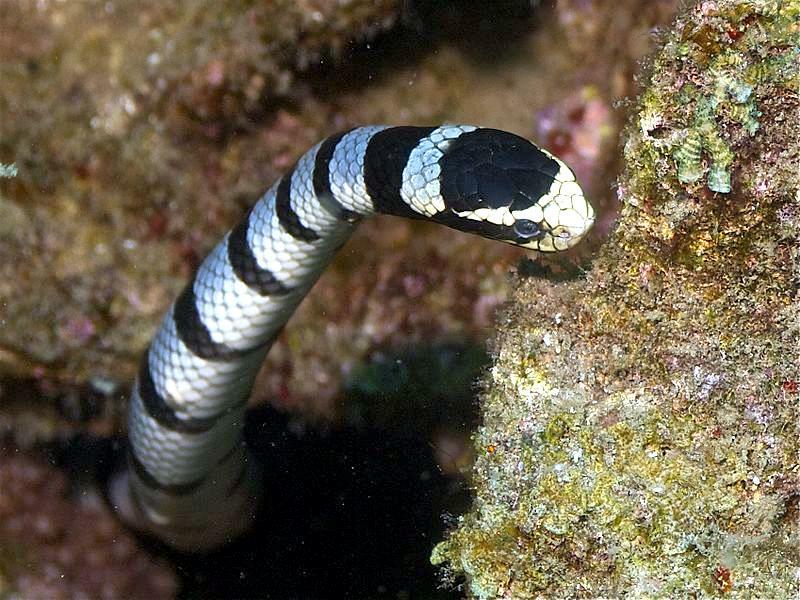 Most sea snakes give birth to their young alive. 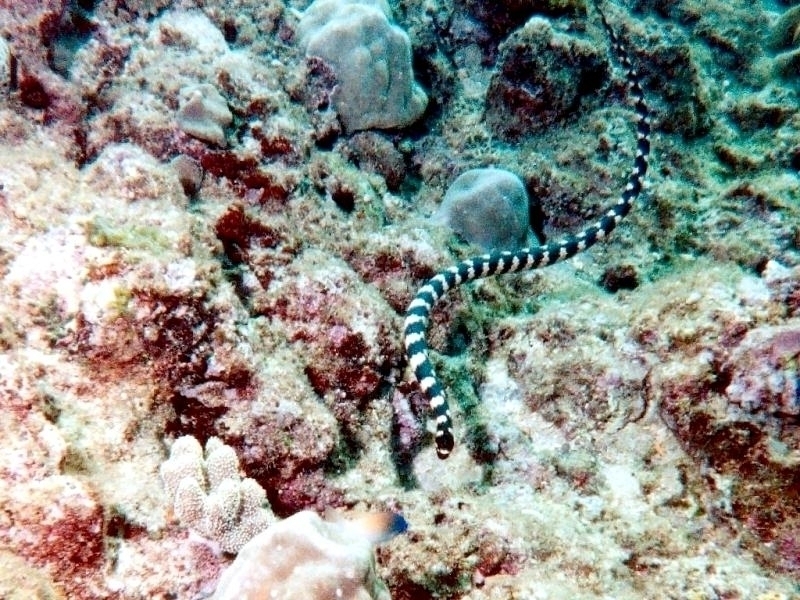 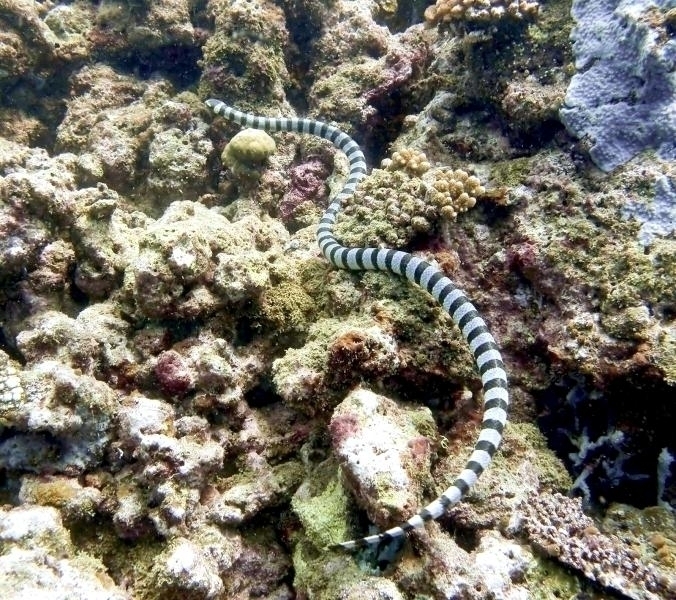 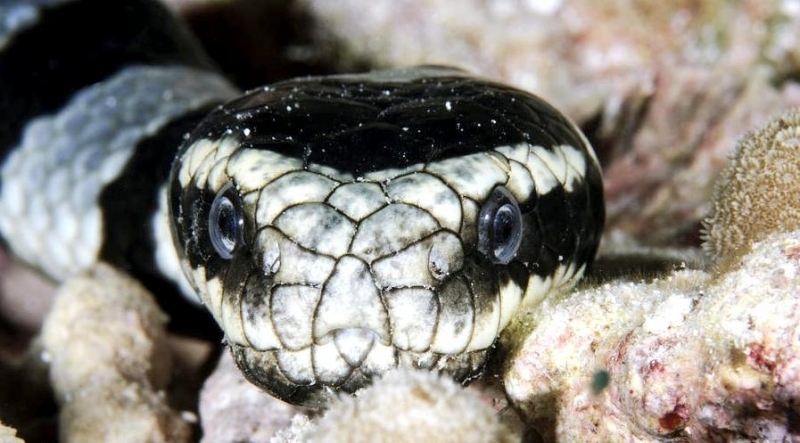 Some sea snakes such as the Black-banded Sea Krait, will come to the shore to lay eggs during the breeding season.